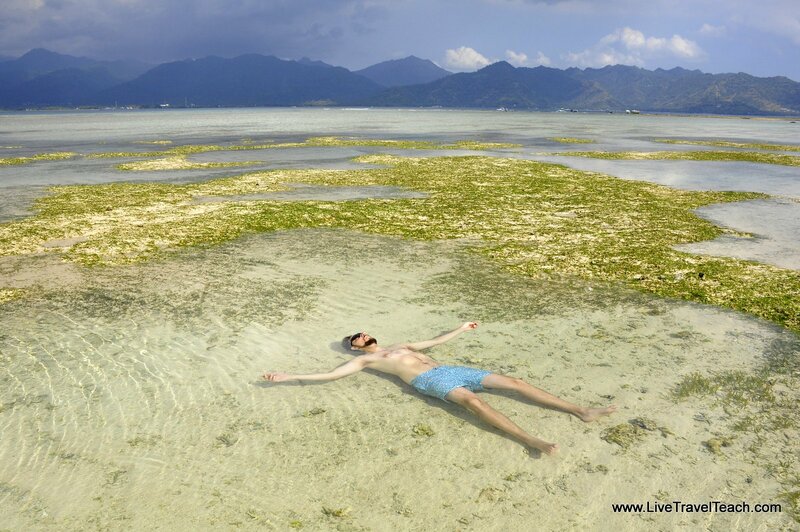 Gili Islands are correctly termed as Paradise on the Earth. You can spend a quality time here by relaxing at the beaches and enjoying the cool breeze. The magical and healing sound of waves will make you feel so much connected to nature. There are so many things to do at Gili Islands that make you feel rejoiced. In this article, we have mentioned some of the “Must Do” things at Gili Islands. Hope you will find them useful. 1. Swimming in the low tide. Gili Air is surrounded by beaches where you can forget all your worries. We spent the majority of our time relaxing here and enjoyed watching the tides change over the course of the week. Swiming can be among the amazing things to do Gili Islands. An interesting part of this island is how flat the seemingly endless beaches are. In the distance, a coral reef breaks the waves creating a large calm area to relax in. When the tide is at its lowest, you’ll find a few crystal clear puddles large enough to submerge yourself in. Swimming at high tide is also good but we preferred low tide. We stayed on the southwest side of the island. It was excellent for sunset but walking on the coral was tough. if you are willing to enjoy it, don’t forget to bring good water shoes. Automobiles and motorized traffic are prohibited on all of the Gili islands. It makes renting a bike the perfect way to get around. It took us about two hours with stops to complete the entire circuit. Biking is among the most thrilling things to do Gili Islands.Along the way, you’ll see beautiful beaches everywhere. There’s a trail that encircles the outer part of the island, be aware that a few stretches are covered in sand requiring you to walk your bike. We laughed ourselves off our bikes during our attempt to peddle through. There were also several great restaurants and cheaper accommodations in the center of the island that having bikes makes easier to access. Renting a bike will cost you 40,000IDR/day or less. If you’re looking for a more remote Indonesia island be sure to check out these great things to do on Sumba? Whether you are an experienced diver or a beginner, Gili Air is a wonderful place to dive. In fact, if you dive anywhere on Bali you’re likely to head to a dive site right by the Gili Islands. The massive coral reefs are teeming with life and while nothing is guaranteed on a dive. There may be high chances that you’ll dive with turtles and other exotic sea creatures. The best site and things to do Gili Islands I went to was Shark Point where I watched a sea turtle eat breakfast in the reef as smaller fish swarmed for his leftovers. As you go deeper, sharks are likely to hide in alcoves beneath the reef. I caught the tail end of a small one as he swam into the darkness but others divers on my boat saw larger ones around the dive site. Dives cost about 490,000IDR each and include all equipment. If you aren’t a diver you can still enjoy the sea life with a snorkel! Check out this SCUBA gift guide! Like many other islands, Gili Air is a place that offers serenity and a chance to disconnect from mundane life and reconnect with yourself. The island has two major studios that offer yoga classes. “H20 Yoga” became our favorite with their focus entirely on yoga and the spirituality the practice entails. The studio is situated in the center of the island encompassed by a tropical forest. Upon entering, the staff were incredibly kind and welcoming and the space provided the “zen” we had aspired to find with nothing but the sound of the birds surrounding us. To our surprise, they had a cafe (which sold green juices and gluten free banana bread), bungalows to rent and a pool in addition to their classes. The class was held in a large gazebo made specifically for yoga and comfortably fit 10 of us but could easily fit 20 more. We attended five classes total and were sad to say goodbye after the last one. If you’re interested in checking out the other studio, “Mandala Blue”, it’s located on the northeast side of the island, directly on the beach. Yoga is one of the amazing and relaxing things to do Gili Islands. H20 offers two classes each day with a meditation class twice per week. Retreats and workshops are frequently offered as well but refer to their schedule. Classes cost 100,000IDR each or we purchased a 4-class bundle for 350,000IDR. The bundle can be shared with as many people as you want. 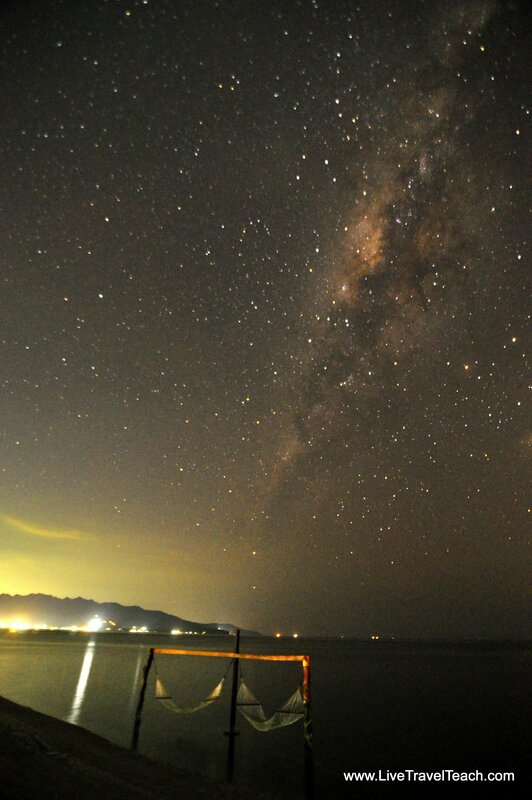 Gili Air is quite remote allowing stargazers the prime opportunity to see a beautiful night sky. We saw shooting stars and a clear outline of the Milky Way every single night. The clouds usually parted from 10:00pm-12:00am each night, but even after midnight there were still plenty of stars to behold. If you enjoy night photography, you’re guaranteed to capture the perfect photo, so don’t forget your tripod and a remote for star-trails. You can’t afford to miss such mind-blowing things to do Gili Islands. 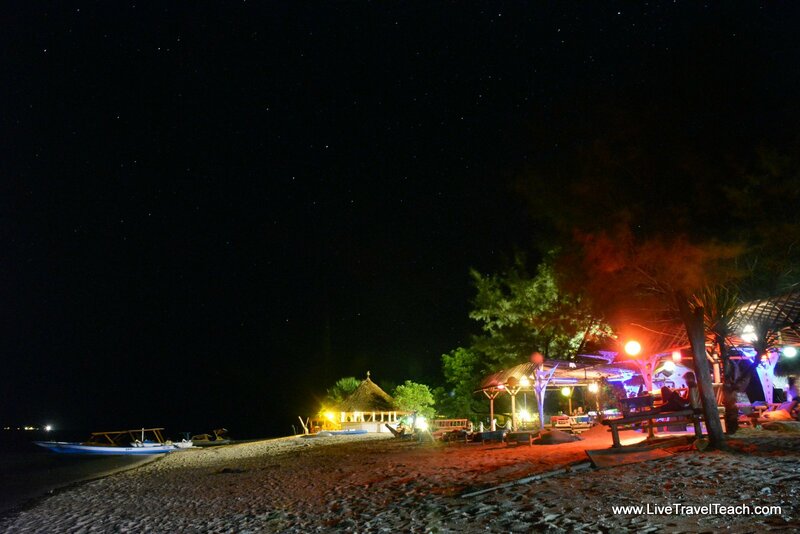 While Gili Trawangan is the main party island, Gili Air still offers plenty of nighttime entertainment. Most restaurants and hotels have a bar that will stay open as late as there are customers but shut down around 11pm or midnight when empty. The resorts share the party nights so check with a local while you’re there for a precise schedule or just walk along the beach and listen for the music. Just about anywhere you go is sure to be psychedelic with great music and drinks. If you really want an all night party you should head to Gili T but if you’re up for something a little tamer, then head to Gili Air! 7. Enjoying the sweet delicacies. Okay, so maybe we are foodies who love to eat. But then again who doesn’t? Gili Air has a wide range of restaurants to pick from with local delicacies, Indonesian staples and great western food too. If you’re all about organic or have a special diet don’t fret because Gili Air offers a solution for every culinary desire. Stay tuned for a more in depth look at our favorite eateries but if you’re heading there in the meantime we recommend Easy Warung’s Gegepek curry found exclusively on Gili Air, Pachamama for amazingly fresh organic meals and the local corn man for a light snack! When the sun gets low a wonderful orange hue spreads across the sky. Sunsets are everywhere but sunset in paradise is even better! When you head to the southwest corner of Gili Air you’ll find a beautiful set of swings and a hammock to play in. If its close to sunset there will likely be a line of travelers waiting to snap a photo. Its well worth the wait, but I recommend bringing some small change to drop in the donation box for the Gili Air schools. 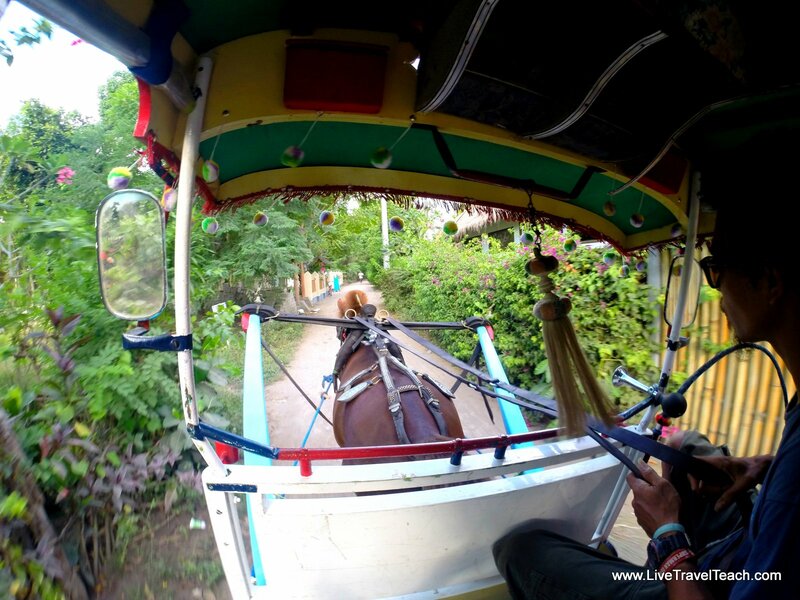 Motorized vehicles are not allowed on Gili Air which makes the most care-free way of moving around the island a horse-drawn buggy. The bumpy ride will take you anywhere on the island for about 100,000IDR. It is the perfect option to take advantage of with your heavy bags when you arrive or for a romantic evening during your stay. There are usually carriages waiting at the port or you can hail one as they trudge along the dirt road. With restaurants lining the shore its easy to find some live music just about any time any day. Locals and tourists jam out together singing popular covers. It’s the perfect way to relax after dinner or sit and stargaze with live background music. If you’re up for more of a party get up and dance but either way you’re sure to love the live music on Gili Air. what an incredible place this seems to be!! 🙂 I have never heard of Gili Air before but it looks like a perfect gateway for relaxing. I never swing in the sea so one more reason why to visit this place while in SEA. Thank you Mike for sharing this paradise with us. Happy to help inspire you for your next trip! 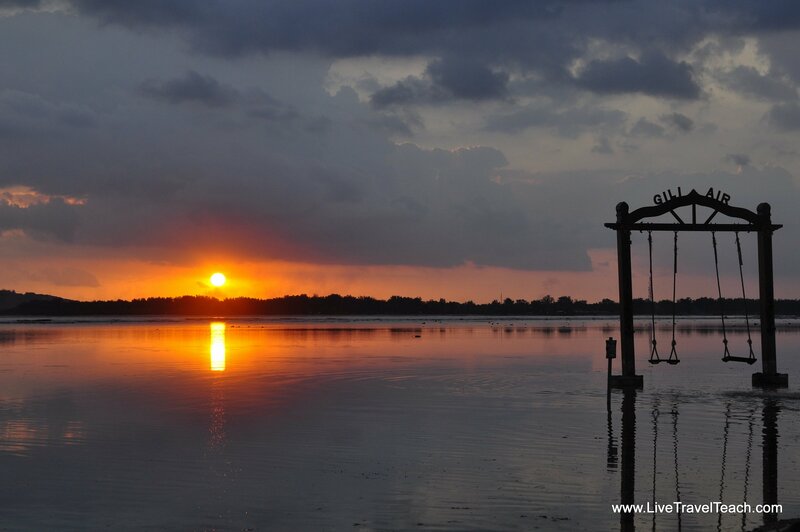 Gili is indeed the perfect getaway for relaxing! That is the real question isn’t it! Luca, if you love 9 out of 10 you have to visit! Nice place in Indonesia to enjoy your time, especially for the night life. I have been there and I think it’s crowded of foreign people that are destroying (maybe we did it already) this lovely island. Your #11 suggestion is perfect! I got to see a lot of the island when I went to my dive site and its so cool. Its sad that many tourists destroy the island but we found most of Gili Air to be quite eco friendly. I have been seeing so many pictures from the Gili Islands recently therefore I am so happy I read your post. How long do you recommend staying here? Is it easy to island hop to the other Gili Islands? How fast and expensive was it to get from Ubud, Bali to Gili Air? 1) I would spend at least 3 days on the island. 3) I think we spent about $40 per person for a van that picked us up at our hotel and included a ferry ticket to the Gilis. You can definitely do it cheaper with public transportation to the harbor but we were a bit lazy. I think it was about 1 and a half hours to drive and then a similar ferry time but they stop on Lombok before the Gili Islands. Between all the stops and waiting to board it took about 5 or 6 hours from Ubud to Gili. I never heard of Gili islands before but I’ve written this down into my must visit list. From the mountains to the sea to the starry night it looks like heaven on earth! Plus the swings in the water, I’ve never seen that before, got to go try them! Nancy, I’m sure you would absolutely adore the Gili Islands! If you don’t like the low tide then check it out during high tide 🙂 We liked how you could float just above the sand during the low tides. Gili air sounds like pure heaven. And so many activities too. I would love swimming in the low tide and watch the magical sunset by the swings. Stargazing is another enthralling activity. Its such a heavenly place with so many relaxing activities! You be in a place like this and you will hate to go back to the cubicle job. So true! That’s why I’ve never worked in a cubicle haha. My classroom is always fun after a vacation. I love sharing my adventures with my students as I plan for the next one. This is basically my dream vacation! I’ve heard all about the beauty of Bali but I never realized how awesome the stargazing was. The swings over the water look so cool! But you made me the most excited about the food there 🙂 thanks for sharing! Stargazing was one of our favorite things during our stay! I hope you make your dream come true one day! Next time I’m in Indonesia, I’ll be heading to the Gilis…so much fun and sun. How can you go wrong? Its the perfect place to relax! I want to go to the Gilis next time I visit Indonesia…so many islands, so little time. I hope you make it back and get to enjoy some relaxation on the Gilis! Some of the dives are easy but a lot of it requires Open Water training. Its well worth it though! Such a great list of must dos! We will keep them in mind if we ever make it that way! Which i am sure we will. The beach looks lovely. I have heard & read wonderful things about this place and your piece has confirmed that. I would like to go scuba diving there. Interesting that you preferred swimming at low tide! Most people prefer it at high tide. And I’d totally be up for the yoga class too! The low tide was just so much fun with calm waters and you could float just above the sand! Gili air looks fab a bit like Gili trawangan with the horse buggy rides, low times , swings and all. I loooved Gili T. Have you been to both though and how would you compare it to air – apart from the difference you mentioned about the party scene. I didn’t go to Gili T but spoke to a bunch of ppl who did and it seems like its very similar but Gili Air is more relaxed. Some nights we would hear Gili T’s music off in the distance as we were leaving the beach. Wow, those star photos! Do you have any tips please? We’re off to Iceland and Norway soon as I’d love to try for some of our own 🙂 We have a tripod but not a remote – is it essential? Thanks! We didn’t use a remote! The tripod is a must though. Crank your ISO up as high as it goes (4000 or something crazy like that), leave the shutter open for 20-30 seconds and see if you can find a delayed shutter setting. That way your finger pushing the button won’t interfere. Brilliant, thanks for this as we are heading to the Gili’s in a month or so! cant wait! I’ve never heard of the Gili Islands until reading this, but at first glance it looks pretty perfect. Like a literal depiction of paradise! I would love to be able to stargaze with a clear sky like that. I haven’t had a good night away from a city in a long time to just look up. If I didn’t get out of the city and stare at the stars every once in a while I think I’d go crazy! Lying around in the shallow pools is so awesome. This sounds like a perfect way to relax. Tel us something about the food there. The food was delicious and cheap! You could get western food but it wasn’t as good as the local stuff. My gf and I preferred the curries but ate some western stuff too. Its very vegan/vegetarian friendly also. Thanks Melody 🙂 The island charm here is absolutely amazing! TBH I had no idea about this place. I wondered if such a long list can be made on only one small place. But I was sold the moment saw the first pic! And the starry sky image is awesome too. I’m glad you like it! Its a small island indeed and you can certainly just relax the whole time but there’s also great activities to enjoy! Those swings look like such a cool place to hang out at sunset. Can you actually use them for an extended period of time or are they there for people to take that “perfect Instagram picture”? There is a line at sunset with a donation box for local schools. But if you go during the day there often isn’t a line. We got lucky a few times and were able to hang out on them and at other times we just had to take a quick photo and let the next person go. I’m sure your friends in Indonesia would have mentioned the Gilis. They are just perfect! You’re indication is right you’ve got to go to Indonesia! Indonesia is a lovely country with so much to see! Where did you go? Wow this is great. I had never heard of Gili islands till now but I will definitely now add this place in my bucket list. 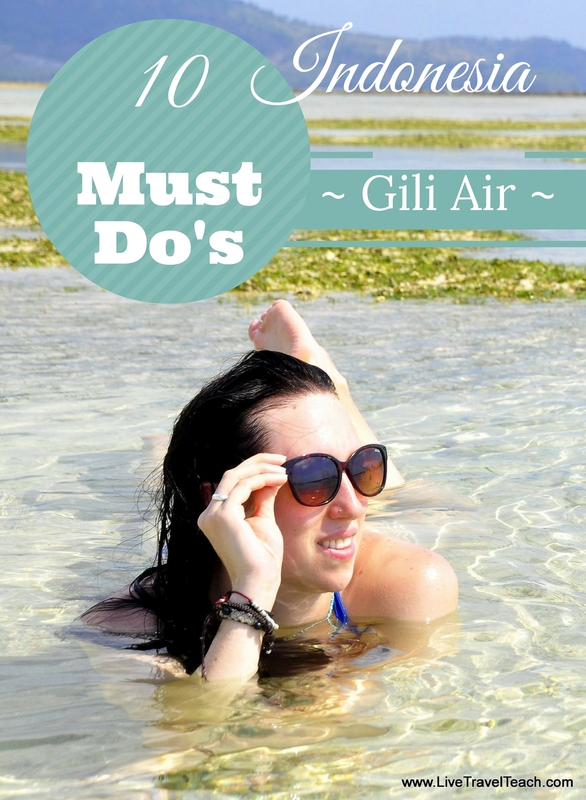 I’ve never heard of Gili Air before. I enjoyed reading about all of the activities you did there. This sounds like a truly active trip with snorkeling, yoga, biking, and swimming. I always look for ways to make my own trips adventurous too.